9. Which Comes First: Sexual Exploitation or Other Risk Exposures Among Street-involved Youth? 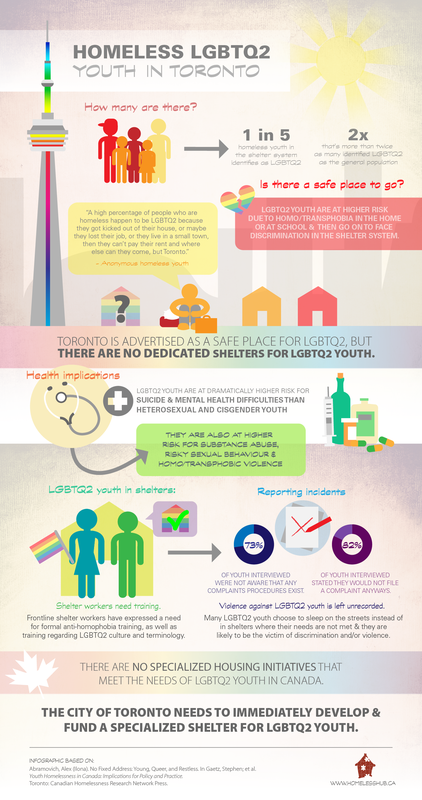 This chapter begins to address the complex issue of LGBTQ youth homelessness and provides initial findings from an ongoing qualitative (narrative-based) study exploring the specific changes needed for Toronto’s shelter system to become safer, more accessible, and more supportive of LGBTQ youth who are homeless. Core findings discussed in this chapter include: shelter staff’s perceptions of homophobia and transphobia in the shelter system, and their thoughts on the training needed for shelter staff to be well equipped to deal with situations of homophobia and transphobia and to serve all youth properly; the need to revise the City of Toronto’s shelter complaints procedure; and the need to create specialized services for LGBTQ homeless youth. The aims of this chapter are to inform policy and practice, to raise awareness of the ongoing crisis of LGBTQ youth homelessness in Canada, and to share the voices and experiences of LGBTQ street-involved and homeless youth. The voices of LGBTQ homeless and street-involved youth are shared throughout this chapter to raise awareness of the ongoing barriers and challenges faced by this group of youth in the shelter system, as well as to recognize their voices and lived experiences as knowledge. It was particularly important to present the voices of these youth, as it is precisely their voices and experiences that are so often marginalized in society. For free Adobe e-text software, return to the Table of Contents page.